Assessing the health of the installation and broadcasting it online (through a set of dynamic, interactive images, or textually like the plant that blogs about itself, etc.) This would be an example of data visualization, which is a way of visually telling a story based on numerical data. Using the data to change properties in the game, like colours and textures. Data could also flow in other directions. For example, values harvested in the game could determine the light levels in the installation. You can design and build the data visualization/data utilization components of Biomodd. You can actually help build the data visualization tools with Processing (a programming language) and a hardware sensing system based on Arduino boards. Even if we don't have Biomodd data to work with right now, we can use real-time plant data shared with us by FoAM from Belgium. This data is in the form of an RSS feed: http://www.pachube.com/feeds/1951. 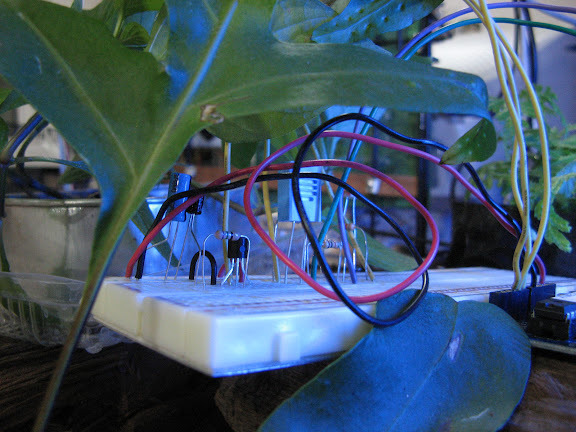 Learn more about it from http://lib.fo.am/plant_sensing. It's important that you see this blog entry and the diagram in it in order to understand the primary goal of this subteam, which is to manage, manipulate, image, and enable user interaction with the data presented in the diagram. So that you can edit this page. We can create subpages if needed. Log in here. View this Powerpoint-style presentation to get an overview of data visualization. You can skip the section on visualizing Noli Me Tangere. When sending out an email to the Biomodd team list that is specifically about data flows and visualization, start your subject with [DATAVIZ]. This helps us keep track of all data flows/viz email threads. And see the section labelled [DATAVIZ]. Ask Diego for the login details to do this. The following shows the data that should be in the data stream harvested from the sculpture. Datatypes in red have not yet been implemented (i.e., we want to get this data but we haven't rigged any sensors that can actually do it yet.) We should probably implement this in a standards-compliant format like EEML.